Welcome to the Tidewater Community College Alumni Council! 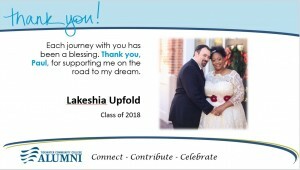 We are excited for your accomplishments, and we want you to know that although your time on campus may be drawing to a close, you will continue to be a member of the TCC family as part of the Alumni Council. You join a global alumni network that shares a common TCC bond. We hope you will embrace this bond by giving back to those students who will come after you. Your involvement in the TCC Alumni Council will allow you to take advantage of activities that will enhance your professional, social and philanthropic growth. Don’t forget to create your Alumni Account to receive exclusive benefits and event invitations. Click here for answers to frequently asked questions about commencement, transcripts, or transfer credits. Features silver embossed university seal and name. Click here to register. Tickets are free. Each grad may bring 1 guest.